Full information can be found in the Marketing Major Undergraduate Catalog and Academics page. Full information can be found in the Marketing Minor Undergraduate Catalog. The marketing major is a four-year program that leads to the Bachelor of Science degree (a minimum of 124 semester hours). The program is accredited by the AACSB - the International Association for Management Education, the premier accrediting association of business schools in the United States and Canada. The mission of the marketing program at Indiana State University is to deliver the future by developing marketing professionals. A marketing professional is an individual who: 1) is knowledgeable of the leading marketing theories, practices, and tools, 2) has the ability to apply such knowledge in local, regional, national, and global contexts in a socially responsible and ethical manner, and 3) participates in career-enhancing activities. 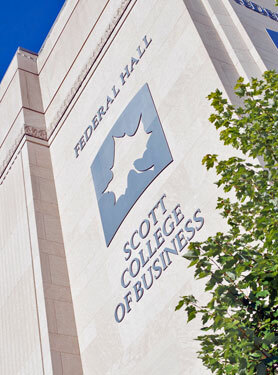 This is accomplished through a primary focus and commitment to excellence in teaching by supporting the shared values of the College of Business which include: 1) the development of life-long learning skills, 2) an emphasis on practical, workplace knowledge and skills, 3) the integration of technology in the classroom, 4) the preparation to participate in a multi-cultural, global business arena, 5) a focus on values and ethics, and 6) a connection with the business community. The marketing program is designed to facilitate entry into marketing positions and to facilitate long-term professional advancement. Course emphasis is placed upon marketing management. After completing a basic body of business courses, the student will prepare for a position in the field of marketing by studying content in the areas of buyer behavior, new product and pricing strategy, promotional strategy, marketing research, and channel management. The marketing student must also design, through consultation with an assigned academic advisor, an individualized specialization that meets the student’s educational goals.